AV conduction may be delayed in either the AV node or the bundle of His. Delays in conduction below the bifurcation of Bundle of His cause bundle branch or fascicular blocks, while atrioventricular conduction is maintained, unless all three fascicles are simultaneously affected. The causes are both intrinsic and extrinsic. However, since the AV node and bundle of His provide a special connection of the atria to the ventricles, focal injury from heart attacks, infections, catheter trauma, is common. followed by a QRS complex. shorter than preceding PR interval. 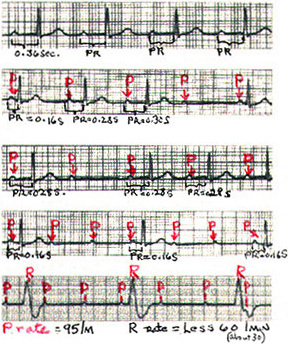 3) Second-degree atrioventricular block, Mobitz type II: Intermittently blocked P waves. PR interval on conducted beats is constant. 4) Second degree, high-grade atrioventricular block: Conduction ratio of 3:1 or more. PR interval of conducted beats is constant. 5) Third-degree atrioventricular block: Dissociation of atrial and ventricular activity. Atrial rate is faster than ventricular rate, which is of junctional or ventricular origin. 1) First-degree AV block is a common EKG finding. Values for the PR interval (the conduction time from the sinus node through the atrium, AV node, and His system to onset of ventricular excitation [depolarization]) over 0.2 second with a retained 1:1 AV relation is defined as first AV block (see top EKG of illustration). It does not cause Bradycardia itself, but in combination with higher degrees of AV block or sinus node dysfunction, can lead to bradycardia and symptoms, resolved by the use of a pacemaker (see figures 84-92). Second-degree AV block occurs when an organized atrial rhythm fails to conduct to the ventricle in a 1:1 ratio, but some atrial-ventricular relation is maintained. Several varieties occur (see illustration, lower 4 EKG's). 2) Wenchebach block is diagnosed when the EKG shows a stable P to P (PP) interval and a progressive increase in the PR interval, until a P wave fails to conduct (see second EKG from top, on illustration ). The PR increments decreases usually with each beat in the cycle, while the R to R (RR) interval shortens. After the blocked P wave, the next PR interval returns to normal. This type block is usually caused by a delay in the AV node, but in advanced cases may occur in the bundle of His. The second degree,Mobitz type I, AV block or Wenckebach phenomenon is usually associated with an adequate ventricular rate and is rarely symptomatic.It is seen in some athletes and is a normal response to rapid atrial pacing.In most patients who have the Wenckebach phenomenon secondary to AV nodal disease,routine prophylactic pacing is not advised ,as it tends not to progress.Rarely.the effective ventricular rate is slow and patients are symptomatic,requiring pacing if vagolytic maneuvers are ineffective.The prognosis in patients with underlying organic heart disease is dominated by the extent of the underlying disease,not the Mobitz type I block. It is common in the acute phase of an inferior wall infarction(heart attack in the buttom of the left ventricle)) and rarely requires temporary pacing in this setting.Reversion is usually prompt(hours to days). 3) In second-degree AV block (called Mobitz type II) a stable P-P interval is present with no prolongation of the PR interval before an abrupt conduction failure (see EKG illustration, third from top). This type block occurs with disease in the His-Purkinje system. In AV block with 2:1 conduction ratio or higher (like 3:1 or 4:1) prolongation of the PR interval before the block is impossible to observe (so type I or II is not appropriate). 4) In 2:1 block, a narrow QRS complex (normal time of inscription) and associated periods of Wenchebach block, or simultaneous sinus slowing (vagus block), suggest that AV nodal block is present. But a wide QRS complex (abnormally 1ong time of inscription) suggests the presence of infranodal block (i.e., His bundle). 5) In third degree AV block (complete block ) the atrial activity and ventricular activity are independent of each other (illustration, lower EKG). Narrow QRS complexes (rates 40-60 beats per minute) suggest AV nodal block. Wide QRS escape rhythms at slower rates imply that the block is in the His-Purkinje system. The indication for permanent pacemakers can be divided into three classifications (Table 1) and are listed in Table 2 according to the most recent indications published by a joint task force by the American College of Cardiology and the American Heart Associatioin in 1998.Many indications for pacemaker implanation are predicated by the presence of symptoms such as fatigue or subtle symptoms of congestive heart failure may be recognized only in retrospect, after placement of a permanet pacer maker. It is generally agreed that complete heart block,permanent or intermittent,at any anatomic level associated with symptoms such as dizziness ,lightheaded- ness ,syncope, congestive heart failure, or confusion is an indication for a permanent pacemaker.In the absence of symptoms,pacing is indicated for patients with third degree AV block,especially with awake heart rates of less than 40 beats per minute or pauses of longer than 3s. In the presence of bifascicular or trifascicular block, intermittent third-degree or type 11 second-degree AV block usually indicates the need for a permanent pacemaker.When patients with these conduction patterns present with syncope,a pacemaker is usually required.However, an electrophysiologgy study may be useful to rule out other causes of syncope (e.g. ventricular tachycardia) particularly if structural heart disease is present.Additionally during electrophysiology study,permanent pacing may be indicated if there is markedly prolonged HV interval(>100ms.) or nonphysiologic pacing or drugs induced infraHis block. Second-degree AV block associated with symptomatic bradycardia is an indication for pacing.In asymptomatic patients with second-degree AV block,type 11, cardiac pacing may be required if the level of the block is infranodal level.There are patients with bundle branch block or intraventricular block or intraventricular conduction delays in whom type 1 second-degree AV block is located at an infra nodal level.